A well-designed leaflet or flyer can make or break the success of your advertising campaign. Not just for advertising new businesses, products or services, leaflets and flyer printing can also be effective in developing wider brand awareness by keeping customers aware and up to date with the goings on of your business. At Leeds Printing Company our aim is to make sure you are happy with your flyer printing all the way from design to print. We offer 5 different stock weights of leaflet & flyer printing, our deluxe flyers are printed on 350gsm to provide the highest quality finish to your design and durability that allows the flyer to be used over and over again I needed. In addition, we offer a 250GSM and 170gsm stock for flyers which is available on matt or with a gloss finish. These premium flyers offer the perfect solution for party invitations, admission flyers or direct mailing campaigns. Finally, our everyday flyer, lithographically printed on 135GSM stock makes it the perfect option for trade shows, leaflet campaigns or nightclub/bar use. We also provide 350gsm uncoated flyer printing for a slightly textured feel. 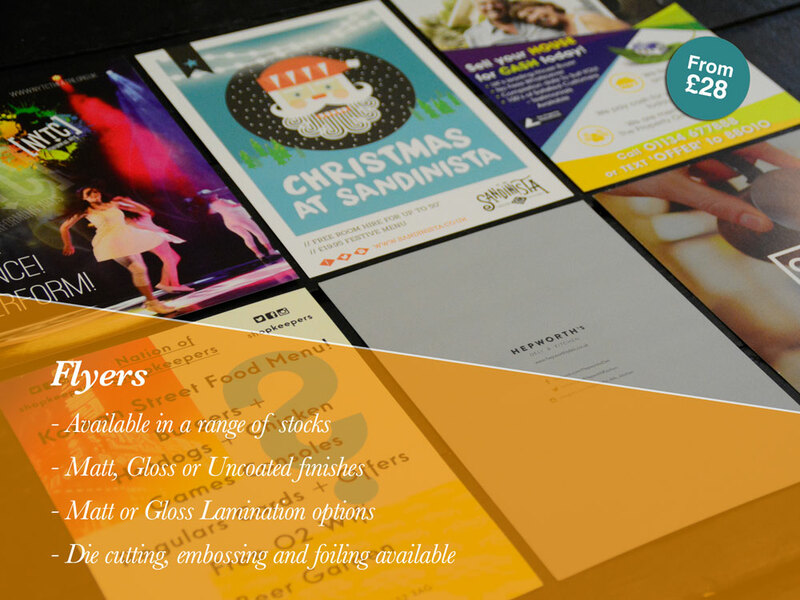 The stocks listed above are our most popular flyer printing and leaflet printing options, however we can print on different stocks if needed. We can also offer bespoke sizes and folds, just contact us to discuss your requirements. Prices below for double sided, full colour flyer pritning. Flyers below 350gsm VAT Exempt. 350gsm Flyers VAT Included. Prices above are for double sided / full colour flyer printing. Standard delivery time is 2-3 working days for quantities up to 1000 and 3-4 working days for quantities over. Orders for flyer printing need to be placed by 16.30 complete with print-ready artwork. Flyers below 350gsm VAT Exempt. 350gsm Flyers VAT Included. Prices below for double sided, full colour flyer printing. Flyers below 350gsm VAT Exempt. 350gsm Flyers VAT Included. What size flyers do you offer? Our standard flyers are A6, A5, and A4. Although we can print flyers in any size from 74mm x 74mm up to 594mm x 420mm. What Stocks do you print Flyers on? Can I split my flyers across different designs? If you have more than 1 design you will need to place separate orders for the quantities you need.